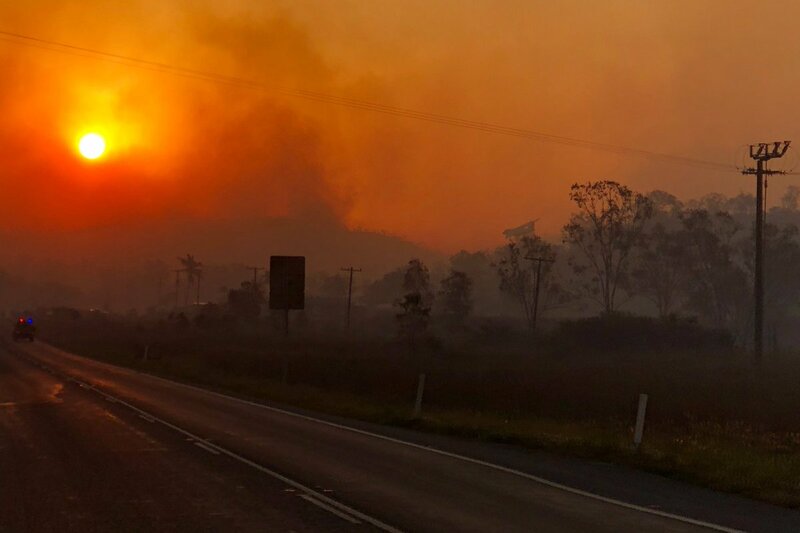 Nearly 10,000 people have been told to flee immediately as more than 140 fast-moving blazes tear through Queensland amid the state’s bushfire crisis. Thousands of people were evacuated from communities in central Queensland after catastrophic fire conditions on Wednesday. About 140 bushfires were burning across an almost 2,000km stretch from Yungaburra, south of Cairns, to Mount French, west of the Gold Coast. QLD fires were been declared ‘catastrophic’, the highest level on the scale. Early on Thursday, residents of two more communities – Campwin Beach and Sarina Beach south of Mackay – were woken by police and emergency text messages telling them they were in danger and to move to safety immediately. Authorities desperately urged people to leave, saying they will ‘burn to death’. 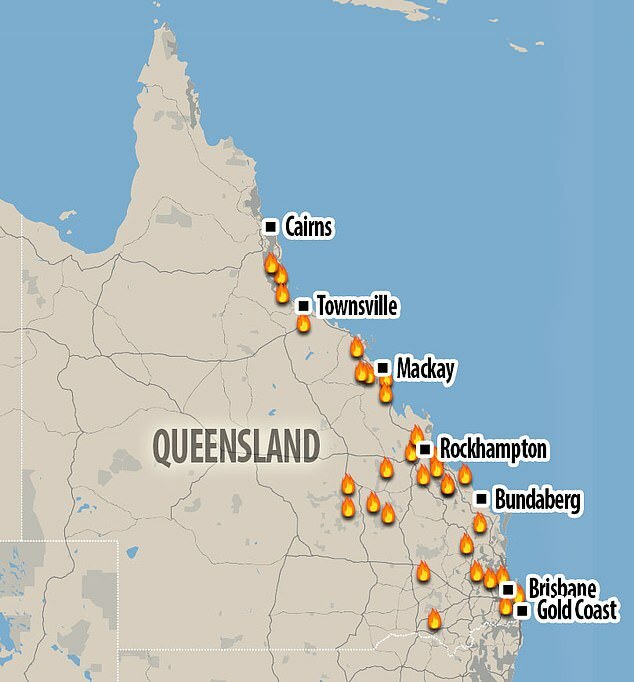 Apocalyptic fires burn in Queensland, Australia over more than 2000km. About 140 bushfires were burning across an almost 2,000km stretch from Yungaburra, south of Cairns, to Mount French, west of the Gold Coast. QFES Assistant Commissioner Gary McCormack warned anyone who had not yet left to evacuate immediately. ‘Leaving their home is the safest option, for them and their families. They need to take advice as given,‘ he told the Nine Network on Thursday. Thank you everyone for obeying authorities in fire affected areas. I urge you to keep doing that. Today’s situation is changing rapidly from hour to hour in many different communities. 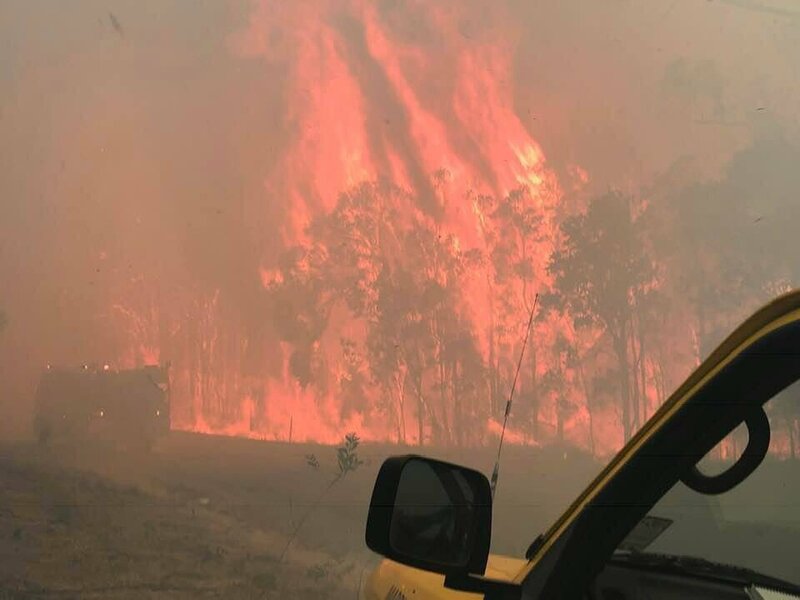 The Queensland Fire and Emergency Service said homes and lives were under threat, with firefighters struggling to have any effect on the blaze. However, favourable conditions overnight allowed firefighters to make some progress. Thick, billowing smoke surrounded the town, as the blaze edged closer to homes and shopping precincts in the region. Dangerous conditions prevailed again on Thursday. But authorities expected they won’t rival what was seen on Wednesday, when Queensland’s fire danger rating reached catastrophic for the first time in the state’s history. There had been no reports so far of property losses in Gracemere, but firefighters say the battle was not over. Overnight, police declared an emergency for the Sunshine Coast community of Little Creek, after a fire threatened homes there. But that was revoked about 3am on Thursday. The communities of Deepwater, Baffle Creek, Rules Beach and Oyster Creek, halfway between Gladstone and Bundaberg, remained under evacuation orders. Firefighters were brought in from interstate to deal with the crisis, which was far from over, with hot conditions expected to continue for days. Queensland Fire and Emergency Services Commissioner Katarina Carroll said people must not try to return to their homes until they were told that it was safe to do so. ‘Do not be complacent, we are not through this yet,’ she said. 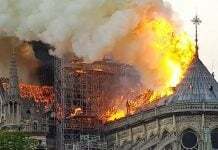 After the US, Australia is now burning down! Terrifying! I hope everybody is fine! Be ready! Get prepared! What happened to Wildfire Today site? Something wrong with that site today. We cannot see this site now. As I mentioned yesterday, this wildfire is not a really wildfire because all the fires in many places started AT THE SAME TIME, AT THE SAME MOMENT. What is the chance we have so many fires start at the same moment? This fires are obviously attacks from Galactic Federation of Light. Schumann resonance today is getting intense. More low vibration people and reptilians are going to be sick or die today. Intense Schumann resonance is just like spraying pesticide over the pests. Yes. Totally correct. This is the same as the wildfires in California caused by DEW. The more things change, the more they stay the same. Milky Way star set to go supernova, just 8000 light-years from Earth! At certain point, all the planets finish their life just like human. As I mentioned before, the 3D Earth will finish her life soon! Their service including Verizon have been disturbed by magnetic storm from Sun or some kind of cosmic event? I tell you that we cannot rely on them anymore. Their infrastructure is going to be destroyed completely soon. 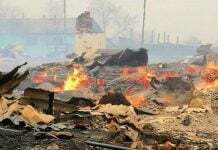 Just like for the fires in the United States, it results from current fights in Bases Souterraines Dracos-Reptiliennes – Cabbala. The use of him their scalar weapons causing a magma firing up to the surface of the Earth. See? They are deliberately burning folks out of their homes, all over the world? We just let them do it? 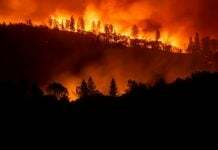 Isis set california on fire and ommitted it, but root cause was moonbeam governor’S forrest and land mismanegment. He spent the money on illegal immegrates and took under table kick backs on this money LIKE ALL HIS TREASONES DEMOCRATE BUDDYS.